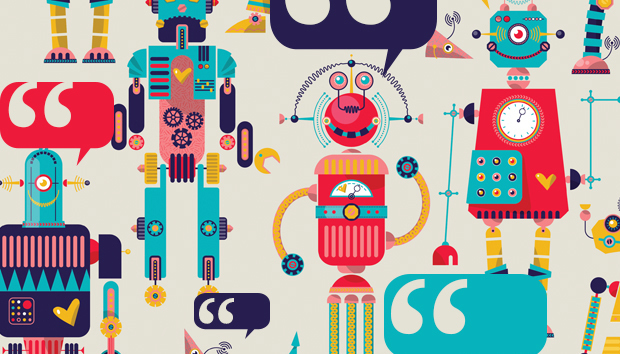 Earlier this year, chatbots were barely a blip on the tech world's radar. Then, at Facebook's F8 developer conference in April, the company announced that its Messenger app would soon feature chatbots from brands including CNN and 1-800-Flowers. Seemingly overnight, chatbots became the "next big thing" in tech and the object of endless media coverage. Other messaging platforms, such as Kik, Line and Telegram, are also experimenting with chatbots developed by third-party companies. And Talkabot, a bot-related conference, took place in Austin in late September. Here are seven things CMOs and other digital marketing professionals need to know about chatbots. "A chatbot is a service, powered by rules and sometimes artificial intelligence, that you interact with via a chat interface," according to ChatbotsMagazine.com. Two main types of chatbots exist today. First are chatbots designed to serve one or more purposes for a business, says Matt Schlicht, founder and editor of ChatbotsMagazine.com. These chatbots are typically found in messaging apps. The 1-800-Flowers chatbot on Facebook Messenger, for example, is designed to help consumers choose a floral arrangement and send it to someone. Similarly, chatbot platforms also exist, any they are virtual assistants such as Apple's Siri, Google Assistant, Amazon's Echo and Alexa, and Microsoft's Cortana, according to Schlicht. These chatbots help users with a variety of information and other needs, instead of helping consumers interact with specific brands. Messaging-app chatbots provide basic communications, ecommerce features, travel planning and more. The Botlist website offers a useful directory of chatbots organized by platform and category. Chatbots today are widely used by brands to drive ecommerce, especially among younger consumers. Chatbots "have the potential to inspire purchases and increase the number of items in people's shopping carts," says Michael Klein, director of industry strategy, retail for Adobe. While chatbots "can lessen the load of a customer service team and sales associates, the bigger opportunity maps back to personalization and engagement," Klein says. "Look at Amazon's Echo, for example. Echo ushered in the wave of conversational commerce, making it easy for people to simply ask for what they need." Uber, for ordering a ride. Burberry, for showcasing its fashion during London Fashion Week. Taco Bell and Dominos, for ordering food. Hi Poncho, a popular weather-forecasting "cat" for Messenger. HelloVote, which helps people register to vote. IcelandAir, which helps search for and book airline flights. George Takei, who played Hikaru Sulu on the original Star Trek TV series, plans to launch his own chatbot on Messenger, according to Adweek.com. Mattress startup Casper built a chatbot for insomniacs, called Insomnobot-3000, as well, and it is only available for between 11 p.m. and 5 a.m.
Casper's service is a successful example of marketing via chatbot, according to Erez Baum, cofounder and CEO of brand-chatbot developer Imperson. "Because the Casper chatbot has everything to do with sleep, or the lack of it, it reinforces their brand," he says. "Casper isn't trying to fool people into thinking they're speaking with an actual human. Rather, the point is simply to get them to have fun conversing with Insomnobot about Seinfeld reruns, midnight munchies, and other things it likes to bring up." Consumers have been using chatbots for years, according to Schlicht. When you call an airline, bank, health insurer or other company, for example, you're often greeted by an "automated attendant." That attendant, or bot, aims to help deliver the information you seek by prompting you for certain commands. These types of interactions usually don't result in great customer experiences, he says, because consumers often navigate through multiple phone-tree layers only to be put on hold — or have their calls dropped. In comparison, interactions with brands via messaging-app chatbots are visual and more immediate. When you ask questions, for example, chatbots can deliver information to provide answers, such as a video or photo, according to Schlicht. Customers don't have to waste time on phone trees or worry about the call drops. Chatbots can potentially deliver much more satisfying engagements with customers, he says. Messaging apps are among the most popular mobile apps today, and that helps raise awareness of messaging-app chatbots. "There are more monthly active users of messaging apps than social networking apps," wrote Jim Tomanchek, a social media and mobile advertising executive, on AdWeek.com. The top four messaging apps (Facebook's WhatsApp and Messenger, WeChat and Viber) have nearly 3 billion users combined, Tomanchek wrote, compared to about 2.5 million for today's popular social network apps. "[R]esearch shows that mobile messaging users are loyal, or at the very least, 'always on,'" Tomanchek wrote. "Messaging apps are used almost nine times a day, five times the average for all mobile apps. A month after installation, messaging apps have nearly double the retention rate of the average for all apps: 68 percent versus 38 percent. A year later, users launch 62 percent of downloaded messaging apps at least once." While messaging app use is on the rise, "the app boom" overall "is over," according to Recode.net. In May 2016, the top 15 app publishers saw a 20 percent decline in downloads on average, according to Recode, which cited data from app-tracking firm SensorTower. In a separate article posted in September 2016, Recode reported that 50 percent of U.S. smartphone users downloaded "zero apps per month" during the three-month period that ended in June 2016. Messaging-app bots are getting more popular "at a time when people are growing tired of individual apps," according to NYTimes.com. "While big brands have long promoted easier access to shopping and customer service through their own proprietary smartphone apps, some consumers are fatigued by having to download a different app for each company." Chatbots are poised to become an important customer engagement tool in the long term, according to Schlicht of ChatbotsMagazine.com. Messaging-app chatbots, however, are in their infancy, similar to the earliest iPhone apps that debuted when Apple's App Store opened in 2008. At that time, "the best app was one that made fart sounds," he says. "So you could think of today's chatbots as being in the 'fart app' stage." The technologies that power chatbots, including natural-language processing and machine learning, haven't evolved enough to enable fluid dialogue between humans and bots that doesn't rely on pre-scripted conversations, Schlicht says. And then there'sMicrosoft's recent Tay fiasco. Tay was a Twitter chatbot released on March 23, 2016, that depicted a pixelated young woman. Snarky Twitter users tricked the bot into making offensive remarks, including positive statements about Adolf Hitler. Within 16 hours, Microsoft pulled the plug on the chatbot, offered a mea culpa, and offered lessons learned from Tay. "I don't think chatbots will replace apps, email communications, websites or humans," says Christian Brucculeri, CEO and director of Snaps, a mobile messaging platform for brands. Chatbots will, however, see widespread, scaled adoption for specific use cases, such as helping consumers make uncomplicated purchases or quickly find the information they want. For those situations, chatbots can be a "better delivery system" than other forms of customer interaction, Brucculeri says. "The bots you see live today may be slightly gimmicky and mostly launched to join in the wave of hype surrounding bots," says Mike Slone, chief experience officer for Travelaer, a software and chatbot developer focused on the travel industry. "But the concept of one-on-one communications with brands via messaging apps is here to stay." When developing chatbots, marketers should work closely with IT from the beginning, for the following reasons. "For maximum security, chatbot communication should be encrypted, and chatbots should be deployed only on encrypted channels," says Mike Baker, founder and principal of Mosaic451, a cybersecurity firm. "While these sounds like obvious safeguards, unfortunately, it's not that simple," Baker continues. "An in-house bot that runs on an organization's system can be set up on a private, encrypted channel. But if an organization wishes to deploy a chatbot on a public channel, like a messaging app, it's at the mercy of that platform's security capabilities." Other potential chatbot security issues also exist. "As chatbots become better at imitating humans, the technology will be used by hackers in phishing schemes and other social engineering hacks," Baker says. "For example, a chatbot designed to imitate a customer or vendor could strike up a conversation with an employee through a messaging app. After rapport has been established, the chatbot could entice the employee to click on a malicious link or hand over sensitive information." "Bots require a lot of testing and support," Slone says. Most IT teams have the chatbot developers handle that work, but they don't necessarily have the resources to support the bot after it goes live. "Don't underestimate the amount of support that's involved in launching a successful bot." Also, because chatbots "typically cross the entire customer lifecycle, companies that are silo-ed may face internal budgeting and ownership issues, as bots cross these silos," Slone says. "The biggest challenge for creating useful chatbots is in the underlying technologies and in the integration with enterprise systems," says Sanjay Aggarwal, a venture capitalist at F-Prime Capital Partners and a chatbot expert. Natural language processing and predictive analytics, which are core to making bots useful, are "not core competencies for most IT departments," according to Aggarwal. Brand chatbots also "must directly integrate into the relevant systems of record for the company," including CRM, help-desk and order-processing systems, he says. "The IT department must take a holistic view of the technology architecture so that the chatbot can be seamlessly integrated into the overall communication architecture of the company, as opposed to being a separate bolt-on solution." « Do you need a digital brand manager?